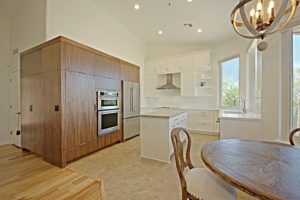 The homeowner purchased a home in North Scottsdale a few years ago and wanted to modernize her kitchen and have an open floor plan. She previously had replaced the floors, windows, and glass sliding door. It was important to keep a similar foot print for the new kitchen and to increase the kitchen storage. Our client hired a design expert to help her with an innovative kitchen layout. The perfect design was formulated, using a custom wood-tone feature wall of flat paneled cabinets, replacing the wet bar and pantry. New shaker style cabinets were installed at the perimeter and island to create a classic open kitchen. Organic White Caesar stone was selected at the perimeter cabinet tops and Urban Safari Caesar Stone at the island top, keeping the design of the kitchen light and bright. A cool white paint and up-dated light fixtures were added to complete this dreamy kitchen! Our client was extremely happy with her new kitchen. She is looking forward to starting phase 2 — the master bathroom!